Are Singaporeans Guaranteeing the Returns and Funding the Losses of GIC and Temasek Holdings? Are Singaporeans Guaranteeing the Returns on Our CPF by Ourselves? Tharman had said, “The CPF Board invests CPF members’ savings in Special Singapore Government Securities (SSGS), which are guaranteed by the Government,” and that, “GIC manages a major part of the Government’s funds, including those derived from long-term liabilities such as SSGS. However, if the government’s “strong balance sheet” and “substantial buffer of net assets” also comes from Singaporeans’ CPF and HDB, then is it the government that is guaranteeing the returns on our CPF, or are Singaporeans actually guaranteeing the returns on the CPF by ourselves? Then, are Singaporeans guaranteeing the returns on GIC as well? If so, shouldn’t whatever returns earned by the GIC using our CPF be returned to Singaporeans? However, did Tharman answer Gerald’s question and are the “shortfalls funded from the Government’s net assets or from the GIC’s assets”? Thus if the GIC does not have any assets of its own, does it not mean that any shortfalls are funded by the government’s assets? And since the government’s assets are also made up of our CPF and HDB value, does this not mean that Singaporeans are funding the losses of GIC from our CPF? If so, when GIC and Temasek Holdings lost $117 billion in 2008 or 77% of the $151 billion value of our CPF at that time, did the government increase the CPF Minimum Sum to fund for their losses? 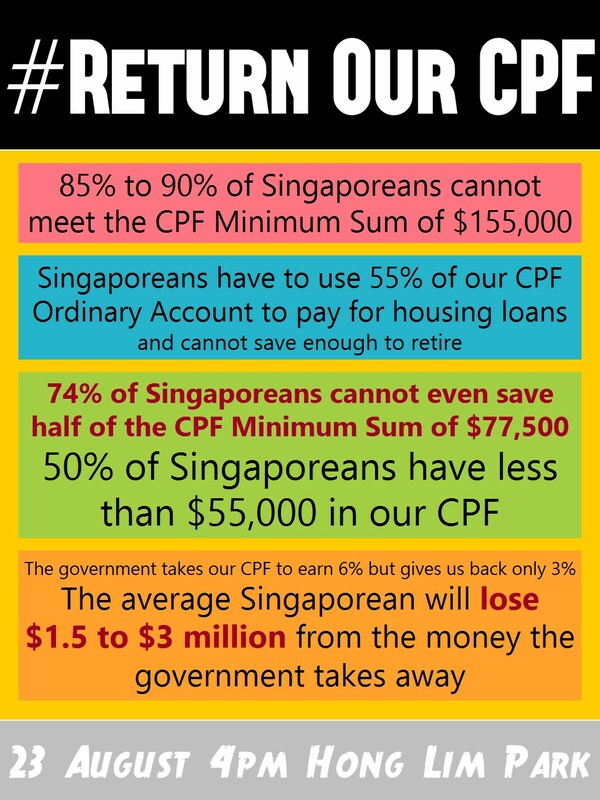 Come down to the #ReturnOurCPF protest this Saturday at 4pm at Hong Lim Park. You can join the Facebook event page here. Look at money flow. Not balance. In good years and bad years, GIC/government simply issue more bonds to “pay” for the CPF interest. Tharman avoided saying this so explicitly. That is what “net assets would have been lower” means. More bonds are issued to CPF to “pay” for interest, without a corresponding increase in asset in GIC. So CPF is guaranteeing a steady stream of billions of cash dollars every year for the government to “invest”. In return the government issues a steady stream of AAA rated bonds to CPF. Now we can see why foreign entities such as S&P and Moody like to give AAA rating to Singapore government. Because the debt is local, not foreign. Debt that are not foreigners to bear and foreign investors do not have to fear of losing their money because what Singapore government did is to owe Singaporeans money to the tune of 111% of GDP. All local debt. If anything happen, the PAP can just print more money and foreigners are still not going to be affected. Singaporeans will be the daft ones to clear the mess PAP created. Foreigners do not have to fear. Contrast this to USA where most debts are foreign. Their QE1,2,3 forces everyone to share their burden whereas Singapore will meet the fate like Iceland once the party is over. Does CPF benefit PAP government or Singaporeans? August 21, 2014 - 9:24 pm Oracle - What Will You Do ?? If an Opposition party says they will return all our CPF money back to us when we are 55 years old. – Will you vote for this Opposition party? Like Atlas, I think it is time for all of us to shrug our shoulders. And rebuild our Singapore around a new group of political leaders. It’s time to stop sacrificing our time and lives in order to help make stupid PAP policies workable. 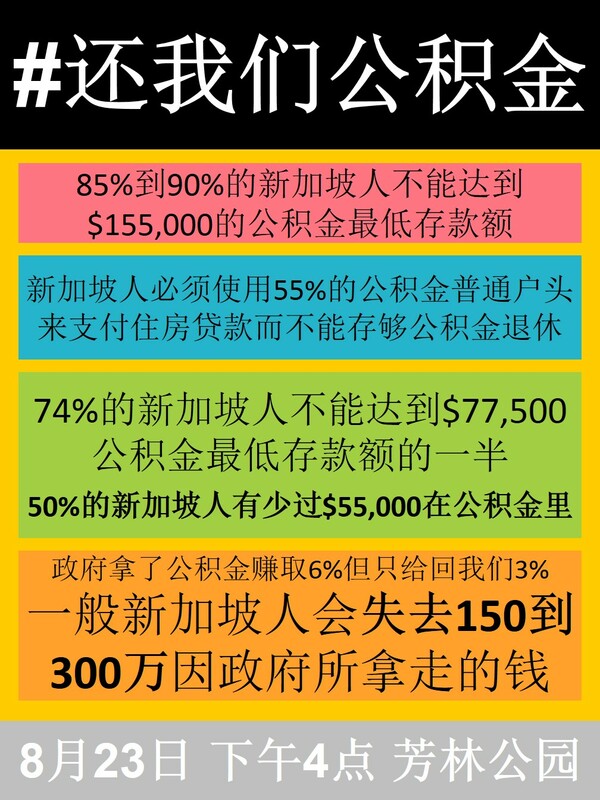 basically it’s the taxpayers guaranteeing CPF return rate when the GIC fails to reach the investment target. 1. if that is the case, where is the incentive for GIC to perform when it knows that whenever it fails, there will be the taxpayers to bail them out? 2. how tempting is it for the government of the day to increase the taxes in order to generate the cash flow to offset poor performance by GIC? 3. in “good” years where the GIC performs above the target, they keep the surplus$$, but in “bad” years the taxpayers is expected to come in to “subsidise”? is it a case of: i win – it’s mine, i lose – it’s on you? in “bad” years, shouldn’t the GIC payout from their capital to make up the shortfall instead? 4. take the public transport companies for example, train segment making money, bus segment making loses, instead of allowing the profit from the train to subsidise the buses, government decides to to let the companies “amputate” the loss making bus segment and sell it back to the government. then we accidentally create this unforeseen dilemma for ourselves, of figuring out whether the taxpayers should subsidise or the commuters should pay higher fares. if taxpayers should subsidise, the bogeyman of higher taxes comes into play again? i do not know how much of then returns is implied, is it 100%? if the value is 100%, i think it’s not realistic. it’s better to make the GIC more transparent on it’s operational cost, so that we can have a full debate in parliament to determine a reasonable sum to pay GIC for managing the money. Xtron is like GIC. When people ask about GIC, government will tell them it is national secret. Similarly, church members should not ask too much about Xtron. form of government. The media won’t let there be any cover-up. but except Singapore, As so happens with CPF scandals, it isn’t the original scandal that gets people in the most trouble – it’s the attempted cover-up. so cover up the truth is a crime, If today there is no way to give them a sentence, but one day, there is a criminal law in wait for them. Singapore’s dictatorship, overbearing toward the same as Myanmar. Singapore Minister Mentor Lee Kuan Yew and Prime Minister Lee Hsien Loong want Teo En Ming dead. Lee Kuan Yew and Lee Hsien Loong want Teo En Ming to die young. I am only 36 years old. I do not want to die young. I want to live to a hundred years old and beyond!! !